One of the challenges of visiting Disney with a disabled child, amongst a whole bunch of other stuff, is trying to make sure they’re in a position to see and appreciate the shows and vistas you do. While you can never really be 100% sure of what they are and aren’t grasping, you know that you have to make an effort and try to cover your bases, or you might be shutting them out of the experience altogether. In addition, many of the videos I want to get might not be the quality or length I was hoping for. And my wife is a not a big video taker, and hasn’t done it as much. 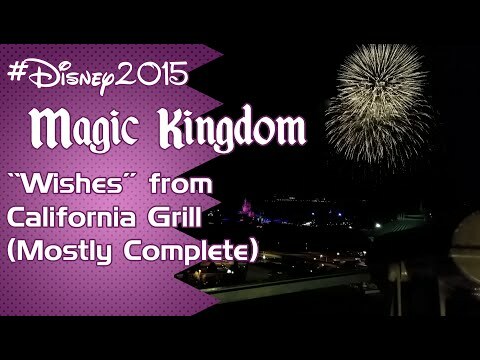 Even so, I attempted to capture all of Wishes from our 2015 trip on the California Grill veranda. There’s a break in the performance, as I didn’t realize the camera was running low on space, and Samsung starts putting a time limit on our videos for no apparent reason when that happens. I’m just getting my channel started, so feel free to subscribe for more videos from our bi-annual Disney trips and reaction videos to Disney stuff and geek culture in general. There’s more to come.